The Umbutfo Eswatini Defence Force allegedly granted entry to Asian nationals through an informal crossing point without producing the required documents. 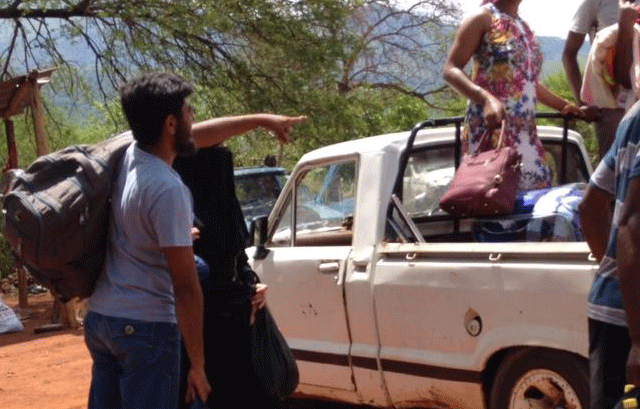 The family of four was seen entering through the informal entry by the Matsamo border gate yesterday. The UEDF Public Relations Office, through Lieutenant Tengetile Khumalo, said informal crossings were an agreement between two countries for residents living near the borderline yet they are far away from the nearby border gate, so that they can easily visit their relatives on the other side, as well as to access basic services like clinics and schools. Khumalo clarified that the agreement catered for residents living near that informal crossing as it is illegal to allow someone from Siteki to use an informal crossing at Malutha, let alone to allow people from other countries to cross. “People from other countries are not allowed to use informal crossings. Our personnel are trained to investigate whether that individual is from another country or not. When people try to cross illegally, they are handed over to the police, who in turn arrest them. The court exercises its discretion to deport foreigners,” Khumalo said. Meanwhile, Ackel Zwane reports that a family of four Pakistanis crossed at an illegal crossing point near Ma-tsamo yesterday without proper identification papers. They were brought in by another Pakistani-based in South Africa driving a vehicle with numbers from the Mpumalanga Province. Eyewitnesses also travelling with the somewhat strange immigrants said the man and his wife together with two children told soldiers on the Swazi side of the Matsamo border that they were not coming for the first time into the country to arrange proper visa papers. The man produced what appeared to be a Swazi ID but soldiers again wanted him to produce other papers for the rest of his family and also the passports, failing which they were to report to the border authorities about three kilometres away. It must be noted that at the informal crossing on the northern side of Matsamo local bakkies ferry those at the informal crossing to the border patrol station three kilometres away near the Mlumati River, where there is also a military barracks. It is here that soldiers interview those brought in by the bakkies, check their identification papers and whether they are carrying contraband. “The man continuously begged the lone soldier not to send them to the border or not but to let them proceed with the journey to Manzini, where they were to get their papers in order. The soldier would hear none of that, but we left them while they were still negotiating as he was literally begging the soldier to let him and his family go,” said a witness who was part of the group. While this conversation with the solider ensured, residents from either side of the fence were complaining that the coming in of illegal immigrants, like the Pakistanis, would force authorities to suspend the facility of using the informal crossing. This is because essentially the two governments agreed to facilitate the movement of residents along either side of the border, especially relatives divided by the colonial boundaries. The ease of movement allows families or relatives returning the same day to use the informal crossing and carry with them limited items and not items of trade such as those that evade payment of customs duties. The other problem was the dresscode of the supposed ‘woman’ in black, who had her/his face completely covered, making people suspicious if he/she was indeed a woman. This emanated from the exotic culture of the couple and their children. It must also be noted that at the crossing point the Pakistani man negotiated to pay a Swazi woman and her daughter occupying the front seat in order to give way for the Pakistani woman and her baby to occupy. This did not in fact go down well with the rest of the commuters, say eyewitnesses, who felt they were putting money first taking advantage of the impoverished Swazi. They also scolded the Swazi woman for letting off her integrity, it was established.